No one plans to get in a car crash, but sometimes life takes turns that were unintended, leaving you with pains that you didn’t have before. Fortunately, you can plan how you deal with the situation: a few appointments with your New Carrollton, MD chiropractor, Dr. Carl Heusler , can help you reduce the symptoms. Despite the fact that any number of injuries can develop as a result of a car accident, some of the most prevalent include whiplash (which can lead to an immense amount of pain in the neck and head); bulging disc (causing back pain, sciatica, or neck pain); and misalignment of your spine. All have the capacity to severely limit your capacity to accomplish day-to-day activities without discomfort of pain and discomfort. Dr. Carl Heusler is skilled in the diagnosis and treatment of auto injuries. After a thorough analysis of your problem and individual history, he will develop the best solution for you individually. Treatments could include spinal adjustments, manipulation by instrumentation, soothing soft tissue therapy, exercise treatment, and a variety of other natural therapies. While some health-care professionals are concentrated primarily on treating the symptoms, Dr. Carl Heusler doesn't stop there. He focuses on finding – and fixing – the cause. At Carrollton Chiropractic, we understand that the greatest relief is long-term, which is what Dr. Heusler sets out to provide for his patients. What If You Weren’t Hurt In the Car Crash? 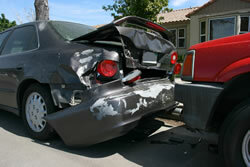 Even if you don’t feel as if you were wounded in the auto accident, a visit to your chiropractor is encouraged. Some injuries cannot be felt straightaway, leaving them to progress until one day down the road they are much harder to treat. Don’t allow that happen to you. Call our office in New Carrollton, MD. Dr. Carl Heusler will make certain everything is aligned so that you feel your best today, tomorrow, and always!